One question I often get from friends, family, and readers is “Is there any way to make a real food diet more affordable?” Of course there is! I’ve written about how to eat a real food diet on a budget and how Amazon Subscribe and Save makes real food affordable for me. Today I want to give you a great example of how a little planning can help you stretch your food budget while serving your family a super-healthy diet. One Whole Chicken For Seven Meals? That Must Be One Big Chicken! Now, you could go really frugal, stock up on turkeys when they go on sale around the holidays, and feast the whole year ’round. But, if you’re like me, you don’t have the extra freezer space that would require. Don’t worry – you don’t need a really big chicken to make it last seven meals. In fact, if you’re buying free range chickens from the store or your local farmer you’ve probably got about a 3-pound chicken to work with. 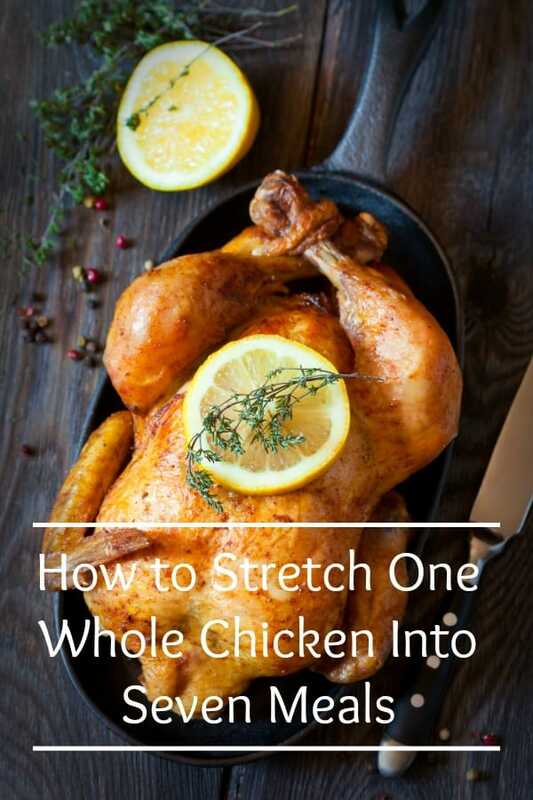 If you’re buying conventional chicken from the grocery store, you might have a 5-6 pound chicken, which gives you more chicken to serve with each meal. Here’s what you have to keep in mind. In these seven meals the chicken will never be the main component of the meal. If you’re living a frugal healthy lifestyle meat should almost never be the star of the dinner plate. Instead, you’ll fill your family’s plates with in-season vegetables and healthy resistant starches, like rice, beans, or potatoes. The chicken is only a small part of each meal, which means you can vote with your dollars to support ethical animal farming practices while eating optimally healthy animal protein – all on a budget. Before we get into the seven meals to make with one whole chicken you should know that you don’t have to make these meals back to back. The great thing about a cooked chicken and chicken broth is that they can be frozen. If you don’t want seven straight dinners containing chicken in some form, simply freeze the chicken and the broth and pull them out as needed to make an easy dinner. Yes, you can roast the chicken in the oven or cook the chicken in your instant pot , but I recommend cooking the chicken in the slow cooker for four reasons. Reason one – I find it easier to get every last morsel of meat off the bone when a whole chicken is cooked in the slow cooker. It’s more difficult for me to get all the meat from an oven roasted chicken. Reason two – Especially in the summer months, it’s more economical to use the slow cooker. The oven heats the house too much. Reason three – You’re going to make bone broth from the chicken carcass and bone broth is super easy to make in the slow cooker. No need to dirty another dish and no babysitting the pot on the stove! Reason four – I don’t own an instant pot. Yet. So, on day one throw the whole chicken in the slow cooker, add your favorite herbs and spices (I like herbs de provence , marjoram , poultry seasoning , celery flakes , onion powder , and garlic powder ), toss in a sliced lemon, sprinkle on some salt and pepper and let it cook for 6-8 hours on low. Yes, you can put frozen chicken in the slow cooker. When I use a whole, frozen chicken I usually give it 8-10 hours, just in case. When the chicken is done cooking, pull the chicken from the bone and serve half of it alongside ample vegetables (I suggest green beans, broccoli, and/or carrots), roasted potatoes or crispy potatoes, and rice. Put the remaining half of the chicken in a food storage container and store in the fridge or freezer for meal number three. Use the liquid from the slow cooker to cook the rice on the stove top for extra nutrients and flavor. Simply strain the liquid into a measuring cup and add water if there isn’t enough broth. Be sure to put the strained bones and such back into the slow cook for making broth. After you remove the chicken from the bones and strain the liquid you need for the rice, set your slow cooker to warm and follow the instructions for making homemade bone broth in the slow cooker. You’ll need the bone broth for meals later in the week. On day two you’ll pull the first batch of bone broth from the slow cooker. (Follow the instructions in the bone broth recipe linked above.) Remember to add more water to the bones in the slow cooker to make more bone broth. Follow my recipe for Easy Creamy Potato Soup. It’s a versatile recipe that allows you to add or omit pricier ingredients such as bacon or cheese. While these extras add to the decadence of the soup, they aren’t necessary for a delicious meal if you’re on a tight budget. Be sure to freeze the leftover broth for future soups. Use the second half of the roasted chicken meat to make my easy chicken quesadillas recipe. Add beans and diced tomatoes to the mixture for a more filling meal. Your second round of broth should be ready to pull from the slow cooker. Store it in a freezer safe container for meal number six. You can discard the broth bones now unless you’re interested in making perpetual broth. After three days of full meals, you probably have some leftovers. In fact, Wednesday and Saturday are always leftover days at my house. If I didn’t have two leftovers day we’d definitely have food waste. Wasting food doesn’t fit in a frugal lifestyle. If you don’t happen to have any leftovers, use the remaining broth from Day 2 to make a quick rice and bean soup. Add some diced potatoes, carrots, and tomatoes for extra flavor and nutrition. If green peppers are in season or you grow your own, these vegetarian stuffed peppers are super frugal. If green peppers are a little pricey, simply buy one green pepper to chop and saute and make a deconstructed stuffed pepper with the ingredients of the recipe I’ll link below. I don’t have my own broccoli and cheesy rice stuffed peppers recipe, so I use this one – Broccoli and Cheese Stuffed Peppers. Of course, I don’t use the canned vegetable stock the recipe calls for. I use chicken bone broth instead. As well, I’ve found this recipe is yummy with or without the cream cheese. If it fits your budget, use cream cheese. If not, don’t sweat it. My Lentil and Vegetable Soup recipe is one of my favorite soups. I was craving mushrooms and swiss chard when I created it. I considered simply sauteing the two in some butter for my lunch, but instead turned it into a soup with lots of other veggies and some hearty lentils for the family’s dinner that night. So comforting. So nutritious. A perfect way to get more use out of a whole chicken by making the soup with the homemade bone broth as the base. If you’ve got leftovers from the week, now’s the time to clean out the fridge. No leftovers? Good job! Your hungry crew is a healthy, happy bunch. But you still need to feed them today, so here’s an idea. Make some crispy potatoes using the recipe I linked earlier. Make some eggs – scrambled, over easy, any way you like. Heat some of the frozen bone broth and serve in mugs. Have your family add Real Salt to taste to their individual mugs. See, eating healthy doesn’t have to be expensive. As long as you plan ahead and don’t expect meat to be the star of your plate you can eat a delicious, nourishing diet on a budget.